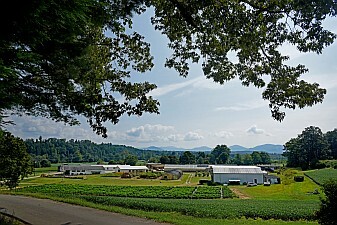 The Mountain Horticultural Crops Research Station started on 14 acres in the Mills River valley in 1949, and was relocated in 1960 to its present location with increased available acreage, with a new office building and a greenhouse. In 1987 a new administrative and laboratory facility was built. The Center now encompasses the research station operations and has grown to 397 acres. The Center is home to research and extension faculty and staff from six academic departments in the College of Agriculture and Life Sciences, and the College of Natural Resources. In addition there are District administrative offices for NC Cooperative Extension housed at the Center, as well as the Mountain Satellite Office of the Science House. The growth and development of the Center is based on the success of its faculty and staff as leaders in laboratory, greenhouse and field studies vitally important to Western North Carolina’s agricultural economy. Located in the Southern Appalachians in the French Broad River basin at a base elevation of 2,069 feet, MHCREC has a varied topography and climate conducive to crop research and evaluation of cultural practices of the region. Core elements of the research program at the Center are tomatoes, apples and ornamental landscape crops. Additional research efforts include vegetables, peaches, biofuel crops, corn, soybeans as well as various specialty and alternative crops.